Sometimes you have to do longer breaks, because there might not be high power charging available. Always keep your portable charger with you if possible. 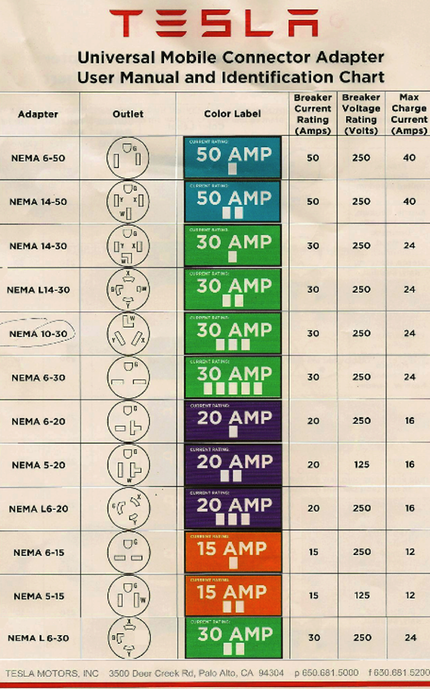 At least then you can charge at almost every RV park on a 50 Amp outlet (Nema 14-50) Below is a brief overview of the varity of different power outlets. NEMA 5-20 or 5-15 is just a regular 120V household outlet. Plan your roadtrip where you can stay overnight close to a charging station. Ask the hotel if they allow you to charge. Most hotels have a laundry where you cn find a 240V outlet. Plug in early in the evening in most of the time your car should be comletely loaded after your breakfast the next morning. We personnaly drove both of our Tesla’s home. The distance was in both cases close to 800 miles (1260 km). The best way is to start from google maps with your starting location. Then add a charging destination depending from you average reach of your car. Always leave about 20 miles left. Keep always a backup charging location close by in case the selected location is not available. Driving pure electric is always existing. Be aware there is always an RV park with 50 Amp outlets where you could connect. Good luck.